Small-scale droughts can have big effects on the Florida Everglades. Ph.D. student Anteneh Abiy is digging deep into these abnormally low rainfall events. He doesn’t have to do go too far into weather data to begin his work. 2017 was drier than usual. The Everglades received 6 inches of rainfall less than the annual average. Fresh water in the Everglades feeds into the Biscayne Aquifer, the main water supply for Broward, Miami-Dade, Monroe and Palm Beach counties. Small-scale drought events have cropped up over the past two decades, leaving lasting impacts on the county’s water supply. FIU Ph.D. candidate Anteneh Abiy is studying the effects of drought on the fresh water supply of the Florida Everglades. Rainfall puts fresh water into the Everglades. But lack of it causes communities to pump more water out from the ground for people to drink, cook with and clean with. At the same time, drought causes ground water levels to drop and salt water from the ocean to creep in to the ground water. The effects of increased demand from people and salt water intrusion circle back to impact the Everglades. As part of his research, Abiy will present different management options that take into account how drought, sea level rise and water consumption all interact to affect the Everglades. He hopes the information will inform sound water management to ensure a sustainable future for the Everglades. 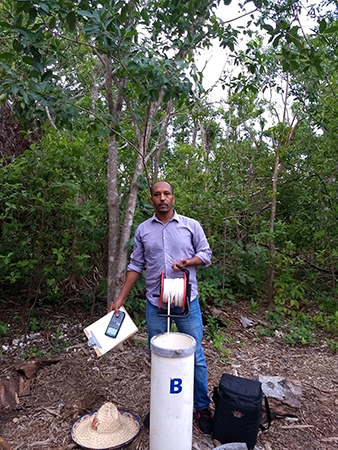 Abiy relies on climate data collected by the Florida Climate Center and the Florida Coastal Everglades Long Term Ecological Research (FCE-LTER) Program. Housed at FIU and funded by the National Science Foundation, it examines how water, climate and people impact the Everglades. His research is funded in part by the Everglades Foundation’s FIU ForEverglades Scholarship. It is great to her from you such an important issue. I am very proud of you.